Not just another book of scales and patterns, this is a method that trains the mind, the ears and the fingers to work in perfect synchronization to respond instantaneously to any given chord progression. This ability is of paramount importance to any musician who wants to improvise in the jazz idiom. Leading jazz players have used this method for years, but this is the first time it has been published in book form. The author offers a comprehensive guide to improvisation on any instrument through chord changes in any key. 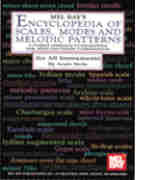 A great source book for dozens of scales from the traditional major and minor forms to the modal scales used by jazz musicians. Even scales from other cultures Arabian, Balinese, Iranian, Hungarian, can be found here. A must-have for any musician who aspires to improvise with authority.